It has been over fifteen years since the Honda City brand debuted in India and since then all the three generations of the line-up had been the undisputed leader of their segment until petrol was still the preferred choice of fuel. But the lack of a diesel engine had, in a way, sent the leader into an exile. 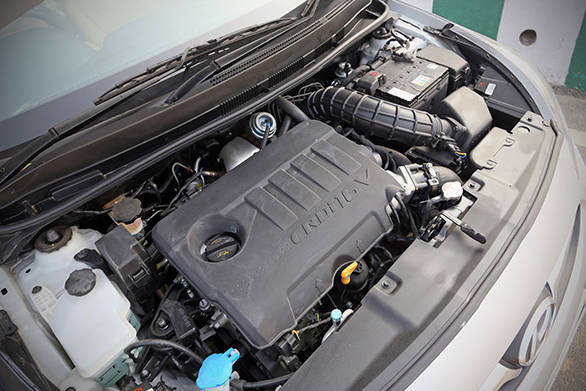 The fourth generation City, though, now aims at restoring the legacy with the i-DTEC oiler under the hood. But while this transition was happening, a new leader, the Hyundai Verna, has taken over the throne  and because it knows that the City has come back in full force, it has sharpened its weapons too. The fluidic-sculpture design philosophy has worked wonders for the Hyundai and has been the forte of the current generation Verna. It has now got a minor facelift. 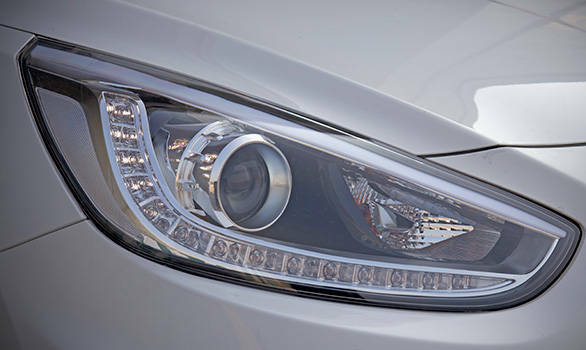 The headlights now have projector beam lamps and wear a string of LEDs that have a daytime-running function. The 16-inch alloy wheels have a diamond-cut design like the ones seen on the Grand i10. It isn't a big departure from the older design and it goes very well with the rest of the car. They are shod with 195/55-section tyres that fill up the wheel-wells rather well. The City on the other hand has alloys that look similar to that in the Amaze diesel and the tyres look a tad too skinny for the wheel wells. Add to it the high ground clearance and the City looks like it is tiptoeing. The City's bodywork has more cuts and creases than the Verna that started it all. It has creases above both the wheel arches and the prominent shoulder line is the highlight of the exterior design. But while the family portrait of the City shows significantly different designs for the first three generations, the fourth generation City comes across as an evolution of the previous design  which in itself seemed ahead of its time. The familiar V-shaped design for the centre console in the Verna now looks dated. The new City however uses Honda's new H-Design language, this gives it a taller and narrower appearance than the older City. On paper though, the length and the width of the new City is exactly same as its predecessor. Design is a personal preference, but in my opinion, the Verna facelift is a tad too gaudy for what already was a flashy design. But with its low-slung stance, fatter tyres and better-equipped headlights, the Verna looks more balanced and upmarket than the new City. The relatively more conservative design approach from Honda though will make the City age better. Unlike its radical exterior, the Verna's interiors have a hint of old-school design with its faux wood trim and symmetrical flow for the dashboard fascia. The familiar V-shaped design for the centre console looks dated. There is a trademark Hyundai blue backlight for all the clocks and displays in the car and with the facelift, even the power-window switches get this treatment. The interiors of the Verna are well put together and the design, though slightly dated, still looks smart. The Honda City on the other hand takes a futuristic approach. The dashboard is asymmetric and tilted towards the driver. It gets a combination of gloss and matte black surfaces with stain-finish inserts. What looks like a microwave oven stuffed into the dash is actually a combination of the A/C controls, the infotainment system and the instrumentation  which are made to appear like a seamless unit. Ironically, the infotainment system is operated with switches, while the HVAC controls have a capacitive touch screen interface. The instrumentation follows the trademark three-pot design and is easy to read. Both, the Verna and the City, get an economy-mode indicator, but the Honda unit looks cooler with the colour-changing arc lights around the speedo. In terms of features, both the cars are closely benchmarked. Their top-spec trims get keyless entry and go, powered mirrors, parking camera, leather upholstery, Bluetooth connectivity and steering mounted controls. 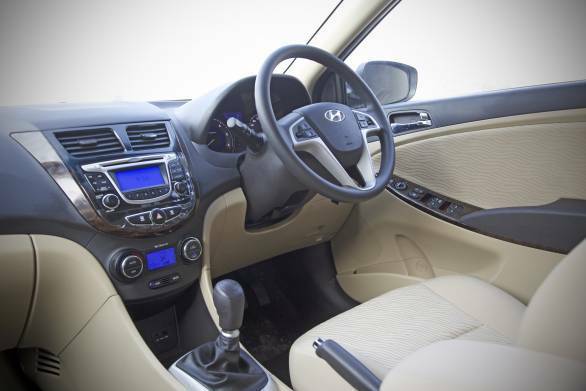 The Verna gets additional equipment like an ionising and filtration system for the AC, an electro-chromatic mirror and a cooled glove box, but the Honda City redeems itself with a sunroof, cruise control and rear AC vents. The Honda City has a better LCD display, and also trumps the Verna with better ergonomics for the switchgear. The City also comes with two 12V sockets for the rear seats  which means that your phones and tablets aren't going to run out of juice, no matter which seat you are seated in on a long distance journey. Speaking of which, the City will gobble up more luggage with its 510-litre boot space, compared to the Verna's 465-litre capacity. In terms of leg space, the City clearly outclasses the Verna with better knee-room, headroom and foot-space. The flooring is relatively flat so seating three abreast is easier in the City than in the Verna; and the section of the floor under the City's front seats has an angle to it, which acts like a footrest for the rear seat passengers. So if the rear seat is where you are going to be, the City is definitely the one to buy. 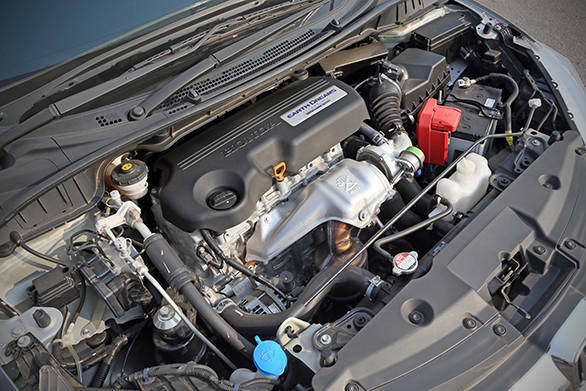 The Verna's 1.6-litre CRDi engine is known to be one of the most powerful and eager mills in this segment. It produces 128PS of power at 4000rpm and 260Nm of torque at 1900rpm. 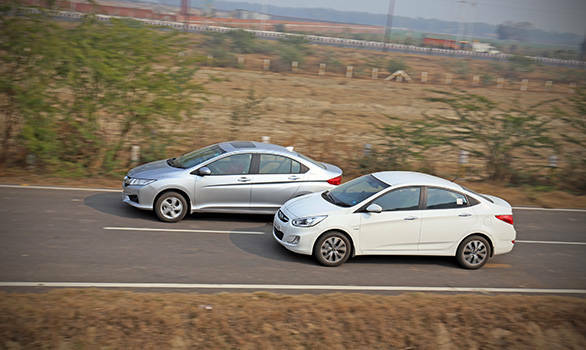 In our test, the Verna managed to sprint from zero to 100kmph in 10.62 seconds with a top speed of 188 kmph. With those figures, the Verna makes the Honda's engine sound like it has come from a segment lower. In fact, it has. The City's 1.5-litre i-DTEC mill is the same engine that powers the Amaze. It produces 100PS of power at 3600rpm and 200Nm of torque at 1750rpm. With the City's body-shell around it, the engine was capable of accelerating from zero to 100kmph in 12.8s. Unlike the Amaze, the City gets a six-speed gearbox and the top speed isn't restricted to 140kmph. Our test car managed to reach 163kmph in fifth gear, the car should max out at a higher speed in sixth gear. 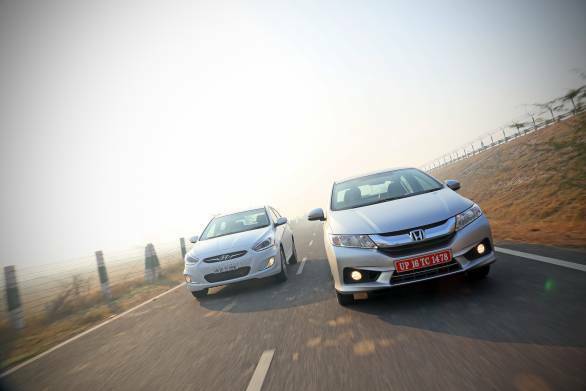 Despite these figures, the Honda City doesn't suffer on drivability. The torque spread is good and the car doesn't feel out of breath in the city or on the highway. The first gear feels awkwardly short, but second, third and fourth offer enough pulling capacity for urban commutes and for fairly quick overtakes. On the highway, the sixth gear makes for effortless cruising. The i-DTEC engine doesn't seem as noisy as in the Amaze, thanks to the better sound insulation in the City. The engine feels more refined to drive than the Verna's, but the latter has better sound insulation overall, making for a quieter cabin. If you are looking for outright power, the Verna's the car for you, but if fuel economy is what you seek the City will impress you. Leaving aside its claims of being the most fuel-efficient car in India, our test car managed to give us 15.5kmpl in town and 24.1 kmpl on the highway  thus giving us an overall 17.65kmpl. The Verna on the other hand returned a fuel efficiency of 12.42kmpl in town, but came close to the City with a highway consumption of 23.67kmpl. The overall fuel economy for the Verna was 15.22kmpl. The Verna's mid-life upgrade is more than just a new headlight assembly. After listening to countless customers complaining about the overtly soft suspension and the unnervingly lifeless steering system, Hyundai has addressed the concerns in the 2014 model. The suspension setup is noticeably stiffer and has a reduced body roll around corners. Ride quality is still pliant at city speeds, but the bouncy high-speed ride of the previous model has been ironed out. The steering is now better weighted at slow as well as high speeds, but it still lacks feel and precision. 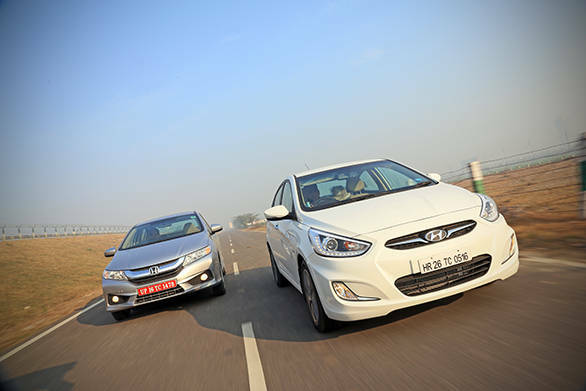 The City has a better suspension setup and steering feedback than the Verna, but neither of the cars is even close to what the Linea or the Fiesta offer. There is a hint of body roll when you push the City around bends, but it isn't unnerving. What could scare you though is the skittish feel from the skinny, low-resistance tyres. Swap these with more grippier rubber and you'll have a good handling C-segment sedan at your disposal. Neither of these cars is meant for the racetrack, but good grip and high-speed stability are essential for a safe driving experience  and out of the two, the City is the better one. On the safety aspect, the City edges ahead. The Verna always had the upper hand with its six-airbags, but the carmaker has mysteriously replaced them with a conventional two-airbag setup that is only available on the top two trims. All four disc brakes with ABS and EBD are a boon and are available on all but the base model. The City has always employed disc brakes only on the front wheels, which is a downer. However, ABS with EBD is standard across the entire line-up and so is the driver-side airbag. The front passenger airbag is available on top three out of the five trims levels on offer. The Hyundai Verna's mid-life upgrade may not sound like a big one on paper, but it does iron out the concerns that we had with the car. The Verna was always the benchmark for features and creature comforts and even after losing out on some of the airbags, it still is one of the most formidable offerings in the C-segment. 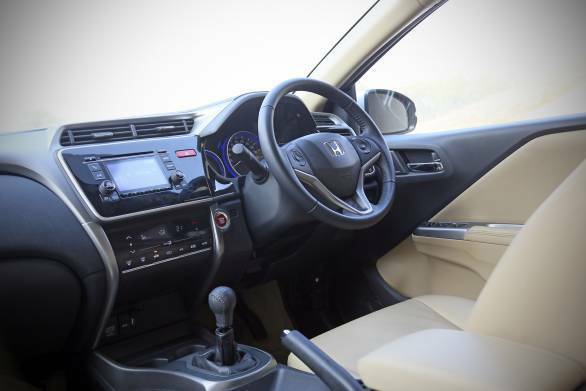 The Honda City on the other hand has been the benchmark for overall performance, fuel efficiency and reliability and the fourth generation model conforms to it, while also adding a diesel engine to the mix. More importantly, it now also surpasses the Verna in terms of creature comforts and safety features to become a benchmark in itself. It is only a matter of time then, before the legacy of the Honda City is restored.